Every morning for the past three mornings, I've gone out to the garden in the first light of day and found three golden raspberries waiting for me. Each morning, I've picked and eaten the three golden raspberries, enjoying them in the garden as the sun comes up for a new day. 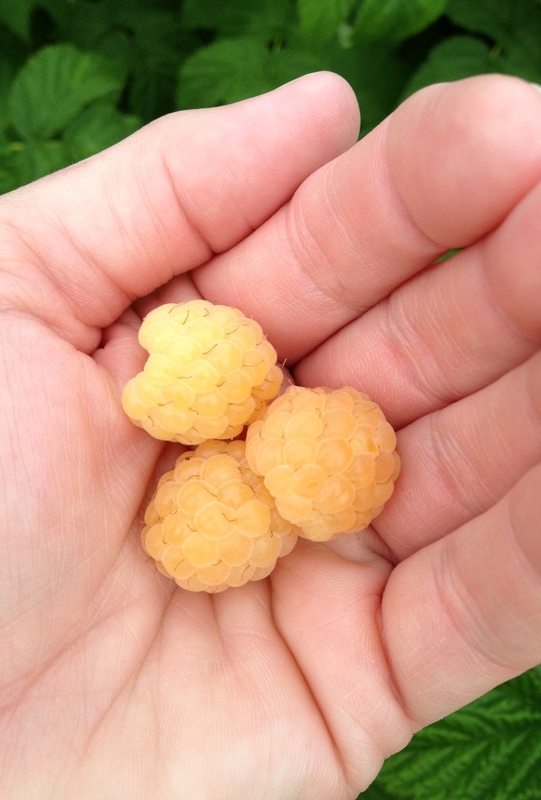 I made three wishes on my three golden raspberries today. I wished first for the means to grow my garden, whether I find friends to trade plants with and free sources of mulch or have the money to buy plants and mulch. I wished also for the strength to tend my garden, in good weather and bad, as I grow older. I wished finally for the wisdom to occasionally sit back and enjoy the garden without worrying about weeds, pests and the long list of what I need to do instead of sitting in the garden making wishes on raspberries. Those are my three wishes - means, strength, and wisdom. Maybe tomorrow there will be four golden raspberries and I can add a fourth wish? What would it be? I must choose carefully for wishes do come true and should never be wasted. Sounds like the time in your garden is making you wise. Best wishes on lucky number three. What lovely thoughts. Well chosen wishes I must say. My wishes would be similar and my fourth - that would have to be patience. Something I lack but am working towards in so far as gardening goes! Thoses are wise wishes. BTW, I really like and in fact have appropriated your idea of "Plopper's Field." I have one and have used it to supply plants for bare spots. What a nice way to focus your attention on what's really important! I like your 3 wishes. If I had a 4th, it would be to have good people to share my garden with. I had a group of friends in my garden today for lunch and, as they were leaving, one said that my garden was like another participant in the party, which pleased me very much. What a great way to savor the moment in your garden! Golden raspberries are delicious! I hope you get a healthy harvest this year. I love this! I think you've got everything covered, really. "What a great way to savor the moment in your garden!" Indeed, good luck on your golden raspberries..The golden raspberries have a unique taste. A very sweet, yet with a tint of sourness. Indeed, the golden raspberries have a unique taste. A very sweet, yet with a tint of sourness. Makes me love it more.